In 2015, I won the New South Wales Voice State Public Speaking Competion which sought to find solutions to some of the world’s most pressing issues. In 2016, I came second nationally in the National Voice Public Speaking Competion. 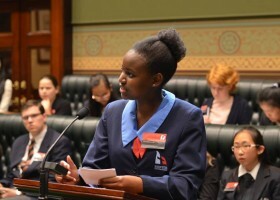 During that year, I also had the pleasure of representing my electorate and the people of New South Wales at the State Junior Parliament. In March 2017, I had the wonderful opportunity of attending New South Wales State Conference to debate and discuss ‘multiculturalism in a changing world’. In July, I will be representing New South Wales at the Australian/Asia-Pacific National Conference. Through these experiences, I have become deeply passionate about human rights and sustainable development. I hope my idea promotes the both and leads to a better world.